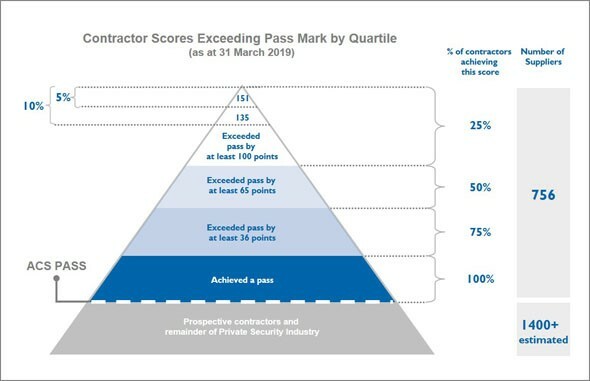 With effect from 1 April 2019 to achieve SIA ACS (Security Industry Authority Approved Contractor Status) accreditation companies must reach the required minimum achievement level for all indicators in the new SAW (Self-Assessment Workbook). The maximum score achievable is +145 points, a reduction of 30 points on the previous SAW. Based on the SIA ACS scores published for the annual period up to 31 March 2019 (when the maximum score achievable was +175), there has been a decline in the overall scores achieved, and this has resulted in the top 15% requiring a minimum score of 123. Using the same average figures, with effect from 1 April 2019 companies audited against the revised SAW (Self-Assessment Workbook) will require a score of 102 to put them in the top 15% of all SIA ACS contractors. SIA ACS Scores for the period 1 April 2018 to 31 March 2019.